It’s hard to believe that Priyanka Chopra and Nick Jonas tied the knot this past weekend. The married couple actually had two weddings: a Christian ceremony and a Hindu one. Priyanka looked radiant on her big day(s), wearing a white, floor-length gown and a traditional red lehenga. Both designs were embellished with ornate beading and lace. But the most breathtaking thing about both of her wedding gowns was the sentimental messages she had sewn into them. Swoon! Aside from her marvelous wedding dresses, Priyanka’s makeup was also a sight to behold. Like her friend Meghan Markle’s wedding day makeup, the Quantico actress kept her beauty look natural. But don’t get it twisted—just because her makeup was simple doesn’t mean it was boring. Priyanka played up her lips with a pink-berry shade and groomed her brows to perfection. She even wore unreleased makeup on her wedding day, which, if we might add, gave her a flawless complexion and that coveted bridal glow. 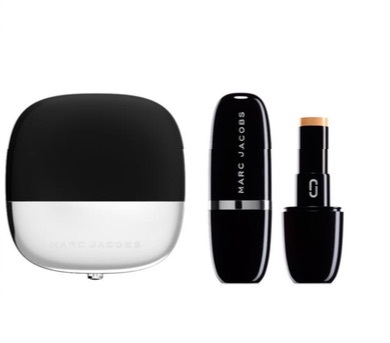 According to a press release sent to HelloGiggles, the actress wore two brand-new Marc Jacobs Beauty products: the Accomplice Instant Blurring Beauty Powder ($49) and the Accomplice Concealer & Touch-Up Stick ($32). Her makeup artist, Yumi Mori, wanted Priyanka’s skin to “shimmer and glow.” She used the never-before-seen blurring power in the shade Scarlet “to give her a warm, luminous look.” Yumi evened out the star’s complexion with the concealer stick. Sadly, we won’t be able to get our hands on the brand’s products until May 2019. In the meantime, however, we can buy the other makeup products Yumi used on the actress on her wedding day. For Priyanka’s eyes, she kept things simple, applying the coral shade On the Dance Floor from the Eye-Conic Multi-Finish Eyeshadow Palette in Fantascene ($49). To make her striking brown eyes pop, she coated the star’s lashes with the Velvet Noir Major Volume Mascara ($26). As for Priyanka’s berry-colored lip, Yumi applied the creamy Le Marc Lipstick in Boy Gorgeous ($30). If you’re adding this makeup to your wish list on Sephora, we don’t blame you. We’re going to recreate what we can, because Priyanka’s wedding look was flawless.